In the early stages of the match it was visible that except O’Shea, the rest of the back 4 stayed quite deep in possession while one of Carrick or Fletcher would drop in to receive the ball and move it up the field (usually towards the flanks). This was to allow Ronaldo to move more towards the center to receive in the open space due to Roma’s wide men man-marking the wide and high United fullbacks (later Heinze pushed up as well to allow Rooney inside). Roma remained quite deep before the first goal even during United’s deep circulation, Totti was the only player moving past the center circle while Pizarro or Vucinic would join the front pressing line if Totti couldn’t apply pressure on the ball. Giggs would frequently drop into the left halfspace in midfield to play as a left central midfielder while Carrick remained deep centrally and Fletcher pushed up into the right halfspace – this formed a 4-1-4-1 type shape with Rooney and Ronaldo as the wingers. United would defend in this shape and Smith wouldn’t play a very active role in backwards pressing so United were frequently defending in a 4-1-4-0-1 shape with some problems pressing out of midfield with access to the ball – but Roma didn’t structure themselves properly to exploit this and attempted many long shots from in front of the Manchester midfield. 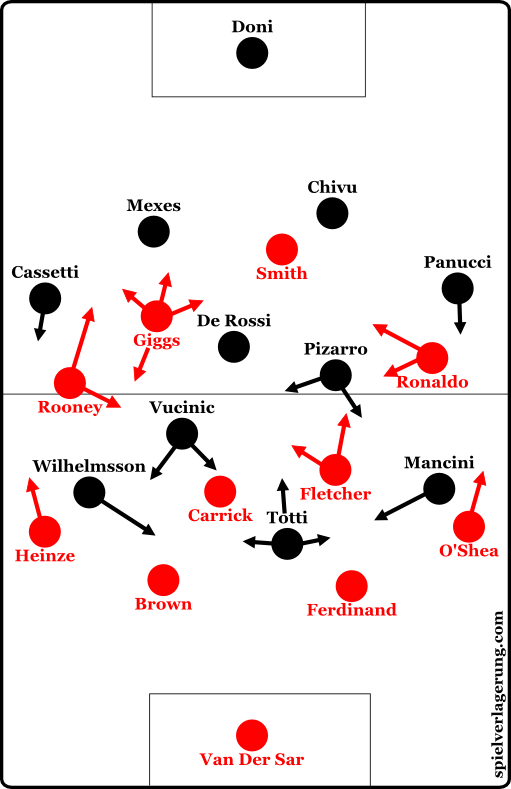 When pressing high up the pitch the Red Devils remained well coordinated in a 4-4-2 with Giggs and Smith pressing the two central defenders while attempting to block any passes into De Rossi in the center. Overall their compactness was quite good in the game (better than the modern EPL teams surprisingly), and they frequently pressed the ball with multiple players which resulted in more ball recoveries in Roma’s midfield and dangerous counterattacks. Manchester United’s main approach in this game was to have a compact 4-4-2/4-1-4-1 shape, press towards the ball, and quickly counterattack to exploit the poor structure from Roma. Because Roma man-marked United’s central midfielders in the buildup they were dragged very far out of position often. As Ronaldo would move inside towards the halfspace, Fletcher would at times move wider and Pizarro would follow him. This doesn’t normally happen as a central midfielder doesn’t like vacating the center of the field while defending (and with good reason), but in this game both Pizarro and Vucinic would vacate the center to follow their man. Though this didn’t continue for too long. At times Vucinic focused on man-marking Giggs when he dropped deeper while Totti would pressure Carrick and the 2 central defenders – this resulted in uncoordinated pressing movements where nobody would support Totti and the central defenders of United could play low vertical passes into the feet of their players for lay-offs. This left De Rossi alone in the center to cover a large amount of space – this is the space Carrick made a run into for his first goal from distance when Ronaldo played a low diagonal pass into the middle to assist him. The second goal came from a vertical ball into Rooney in the left halfspace from Wes Brown – Rooney was able to find this space as Pizarro and De Rossi were quite isolated in the center and he laid the ball off to Carrick who played an immediate diagonal out to the untracked Heinze running down the flank from an overlap on Rooney’s more central position. Heinze played the ball inside to Giggs who had time and space in the center of the field in front of Roma’s defensive line. Smith made a simple run behind the defensive line to penetrate the space the defender which began to press Giggs was vacating and scored. The third goal came immediately after the second as Pizarro made a run through the halfspace and Totti played him through in a tight combination between the lines and Pizarro lost the ball on a poor cross. This left De Rossi covering the entire middle of the field once again while Cristiano picked the ball up just outside the box and began attacking that space. The ball was played through into Smith who laid off to Giggs down the right flank who played a low cross across the face of goal which Rooney ran onto and tapped in. Roma frequently played with both fullbacks pushed up, the two wingers moving inside towards the halfspace, and Vucinic joining Totti in the center between the lines. This at times looked like a 2-2-6/2-4-4 shape which lacked counterpressing when they lost the ball to stabilize the transitions even though they had high numbers up the field. High numbers up the field + lack of counterpressing vs. this Manchester United’s counterattacking = football suicide. 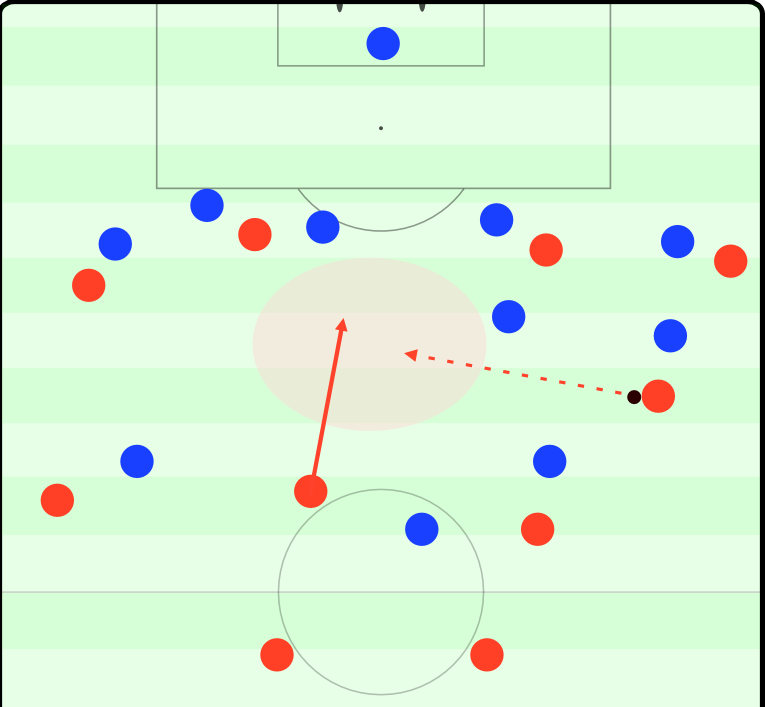 United exploited the lack of pressure or coverage in the center of the field during transitions and looked like scoring on most of their transitions. The rest of the game continued in this fashion as Roma didn’t fix the problem which resulted in a 7-1 score line and the Red Devils advancing to the semi-finals. After this tie United ran into an AC Milan team (who also knocked Manchester out 2 years earlier on the way to the final) which had the competition’s top scorer – Kaka – at the peak of his career. They won the first leg 3-2 but then fell 3-0 to the Italians in the second leg and crashed out of the competition. AC Milan were the eventual champions with a victory in their “revenge match” against Rafa Benitez’ Liverpool to whom they blew a 3-0 lead at halftime in the final 2 years before. Finished 2nd in the group with 1 point less than FC Bayern without losing a match – but drawing 4 out of 6. Defeated Inter Milan 3-1 in the quarter-finals, Juventus 4-3 in the semi-finals, and then defeated Bayern Munich 2-1 in the final to become champions. Finished 1st in their group with only 1 loss (against Fiorentina) and 1 draw (against Valencia). Lost in the quarter-finals 3-2 to the eventual champions Real Madrid CF. Finished 2nd in their group to Valencia with 0 losses – but drawing 3 out of 6. Lost 3-1 in the quarter-finals to the eventual champions FC Bayern. Finished 2nd in their group to Deportivo La Coruna while being even on points but having lost 2 matches while Coruna lost none. Defeated Deportivo La Coruna 5-2 in the quarter-finals but then lost to Bayer Leverkusen 3-3 (via away goals) in the semi-finals. Finished 1st in their group with 6 points more than the 2nd placed Juventus, winning 4 matches out of 6. Then lost 6-5(!) to Real Madrid CF in the quarter-finals. Finished 1st in their group with 15 points having only lost 1 match (against 2nd placed Stuttgart). Then lost 3-2 immediately in the round of 16 to the eventual champions FC Porto who were coached by The Special One. Finished 2nd in their group to Lyon with 11 points as they drew 2 matches and lost 1. Lost 2-0 in the round of 16 to eventual finalists AC Milan. Finished last(!) in their group with 6 points (though 2nd placed Benifica had 8 points) and didn’t even make it to the knockout rounds. Then came the year this analysis was done on (2006-07) where they lost to AC Milan in the semi-finals as I mentioned earlier. Besides their one good run in the 2001-02 season United either lost in the very first knockout round or didn’t make it out of the group stage until this season which they defeated Roma 8-3 in the quarter-finals. For any of you Manchester United fans that are reading this – at least they almost always lost to an eventual finalist or champion, right? What’s impressive about this is that the club stuck with Sir Alex Ferguson through the rough results until he was able to build up one of the best teams of his era. They trusted in his competence in regards to solving problems the team had, building new teams, and didn’t overreact to bad results in his 27 year reign at the club – which is surprising considering how quickly managers get fired in modern football when they begin having poor results for a season or two. On a serious note the lineup in this matchup was made up with the likes of Ronaldo (22), Fletcher (23), Carrick (25), Rooney (22), and Evra (25). Mixed in with a core of players from the Class of ’92 this was a team coming into its own. As we all know, the season immediately after this was when Manchester United won the Champions League final against Chelsea and Cristiano scored an incredible 42 goals in all competitions on his way to winning his first Balon d’Or trophy. United then participated in 3 of the next 4 Champions League finals with the same group of players – though they ran into perhaps the best team in history in Guardiola’s FC Barcelona in 2 of those finals! Nevertheless, I enjoyed making this analysis and looking at the early stages of one of SAF’s most talented teams ever.